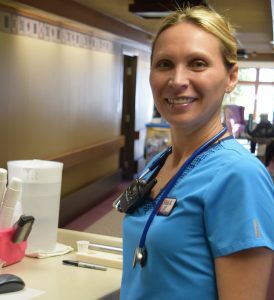 In the know Archives - Maplewood of Sauk Prairie •	Experienced employees regularly help on a personal and professional level by giving guidance and support. It is common for family members to consult with Maplewood staff about what to do for their loved ones. •	3.5:1 ratio for resident to staff member. •	On-site speech, occupational and physical therapy with licensed therapist, 6 days a week. •	Use non pharmaceutical interventions such as diathermy & ultra sound to reduce both falls and pain management. •	Maplewood uses a multi-disciplinary approach. They look at nutrition, dehydration, overall medicine management and activities that encourage a positive distraction and will give residents purpose. With dementia, memory loss is only the tip of the iceberg. A person can’t get back the memory that has been lost. At Maplewood we stimulate what remains. Individualized care plans are created by a nurse with coordinating activities that work around any skills which have been affected. For instance, music, dancing, rhythms and prayers are parts of memory that will always remain, so those activities are incorporated into daily activities. To make an analogy many people can relate to, as a parent, you instinctually want your child to be cared for by the best person. You can utilize an inexperienced teenager or a very experienced adult and there will be a very different level of care. It is the same when looking for senior care. At Maplewood there is tremendous “value added” when care providers have specialized CNA training. Taking care of a loved one who requires consistent care can be very difficult experience. 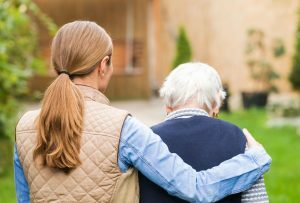 Of course, the role of caregiver is a very heart felt, nurturing and loving experience, but over time is can also be very wearing on the caregiver. For the caregiver, the requirements are great and can cause a great deal of stress, worry and a physical toll over time. The caregiver often does not receive "a break" from their role, sacrificing much of their own freedom and lifestyle to care for their loved one instead. The caregiver often places their needs behind that of their loved one for months or even years, which can create a very tenuous position. Fortunately, there is another option that can be utilized that can help everyone involved; the loved one, the family and the caregivers. This option is called Respite Care and is a type of shorter term care that allows the caregiver to take time away from their caregiving responsibilities and also helps the loved one with other socialization and a loving and caring environment to be cared for. The loved one can be cared for at a facility, like Maplewood of Sauk Prairie, for weeks or even months, until the time comes when their care can be taken over again. They are cared for by a skilled staff that has significant experience in the area of elder care and/or memory care. The Benefits of Respite Care for the Loved One There are a variety of benefits that your loved one receives through respite care. The Benefits of Respite Care for the Caregiver The caregiver also experiences benefits from short term care of their loved one. There are times in life that caregivers may need a "break" from their caregiver responsibilities for a short period of time. When the situation arises, the professionals at Maplewood of Sauk Prairie in Sauk City, Wisconsin are prepared to help you in this process. Our respite care services allow us to take care of your loved one in the way you expect, for a specific duration of time. This allows you to take some time off to "de-stress", unwind, take a trip, complete a project...whatever it is that you need to do. Should you want to learn more about our respite care program, call us today at 608-643-3383. Celebrate Earth Day Since 1970, the world has celebrated April 22 as Earth Day, a time to bring environmental awareness and protection into the spotlight. Many communities honor the day with rallies or festivals where seniors set the stage. If you are looking to contribute, there are plenty of ways to get involved and leave the planet a little better than you found it. Here are a few: Take an intergenerational nature walk. Go for a nature walk with your grandchildren or other youngsters and share your favorite parts of nature. Bring along a trash bag and pick up any litter you see along the way. Plant a legend. Arbor Day takes place this month, too. Honor both days by planting a tree with friends and family. This act will leave a legend of beauty for generations to come. Paint the community green. Work with your neighbors and community managers to ensure that your home is operating a green as possible. Brainstorm together for ideas to reduce, reuse and recycle. Lead a letter writing charge. Contact your local or state governments about ways to protect or improve the environment where you live. Encourage others to do the same. While you’re asleep, your brain is busy. Medical experts say even at rest, crucial cognitive functions are taking place, and neurons in the brain stay active. Amazingly, as you slumber, the brain performs several vital functions: it processes information, forms new memories, makes creative connections, cleans out toxins, and stores information about physical tasks.Maplewood of Sauk Prairie Encourages You to Laugh out Loud Is laughter really the best medicine? Many medical experts report that laughing produces significant health benefits. Easy exercise: Think about what happens when you get the giggles: Your heart rate increases, you can’t catch your breath and your facial muscles are sore. That’s right – laughing is like a mild workout, burning up to 50 calories in just 10 minutes. A happy heart: In addition to aerobic benefits, laughing heartily can improve circulation and help balance blood pressure levels, boosting cardiovascular health. A stress-free smile: While some stress is good, too much can cause both mental and physical health problems. Laughter relieves stress by reducing stress hormones and releasing endorphins (feel-good chemicals) in the body. People usually feel more relaxed and happier after laughing, even during trying situations. Rest and Relief: Laughter is considered a natural pain reliever, both by releasing endorphins and by serving as a temporary distraction from either physical or emotional pain. Watching a comedy before bedtime can ease painful symptoms and relax your muscles so sleep comes easier. Fun Friendships: People love having someone to laugh with. Connect with friends by sharing a joke or two. The result is an active social life – a crucial component of good health and happiness. “In this world, a good time to laugh is any time you can.” Linda Ellerbee “All you need in the world is love and laughter. That’s all anybody needs. To have love in one hand and laughter in the other.” August Wilson “Nothing shows a man’s character more than what he laughs at.” Johann Wolfgang von Goethe “There is little success where there is little laughter.” Andrew Carnegie “You can’t deny laughter; when it comes, it plops down in your favorite chair and stays as long as it wants.” Stephen King “Against the assault of laughter nothing can stand.” Mark Twain Maplewood, Sauk City WI Offers Foot Health Tips. Due to medical advances and general health awareness, the life expectancy for Americans has increased by 30%. Older people have become a significant segment in our overall population and that number is steadily growing. In the year 2000, for the first time in American history, the older population outnumbered children. Being able to move around freely helps older people to lead satisfying and useful lives and contributes to independence. If older people have foot problems, it makes it difficult for them to work or participate in social activities. According to the US National Center for Health Statistics, NCHS, the leading cause of limiting a person’s mobility is the impairment of the lower extremities. Besides foot problems, other factors that lead to immobility are lower back, knee or hip pain. The NCHS reports that ¼ of all nursing home residents cannot walk and 1/6 can only walk with assistance. The foot has been referred to as the “mirror of health”. Signs of health problems such as dry skin, brittle nails, burning and tingling feelings of cold, numbness and discoloration bring people to see a foot doctor. Podiatric doctors often become the first one to see systemic conditions such as diabetes, arthritis and circulatory disease in the foot. Foot problems can be prevented. Yet, people of all ages tend to believe that it is normal for fee to hurt and do not seek medical attention. There are over 300 different types of foot problems. For most people, these ailments are a result of neglect or abuse. The good news is that many foot problems can be successfully treated – even for the population facing retirement years. Normal wear & tear on your feet cause changes. As a person ages, the fatty pads on the bottom of feet is lost and the feet tend to spread. Over the years, additional weight gain can affect the structure of bones and ligaments making measuring your feet prior to purchasing shoes important. Wearing poorly fitting shoes often leads to foot problems as does wearing high heeled shoes. Women, both young and old, have four times as many feet problems as men. When a person takes preventative foot problem measures, they increase comfort, limit the amount of additional medical problems, reduce the possibility of hospitalization due to infection and reduce medical problems that could require hospitalization or institutional care. Keep walking even if you don’t feel like it! The cost to care for a bedridden patient is a lot more than an ambulatory one. With this in mind, many podiatric physicians are providing services in hospitals and nursing homes because they want to keep older people on their feet. Early diagnosis and treatment by physicians can help reduce amputations, infections of the feet and other problems brought on by diabetes. Health Tips for Your Feet: •	Walking is the best exercise for your feet. •	Trim or file your toenails straight across to prevent ingrown toenails. •	Proper fitting shoes are the key to preventing serious foot problems. •	Check your feet daily for redness, swelling, sores or cracks. •	Never cut calluses with a razor or any sharp instrument. Use over the counter items if prescribed by your doctor. •	Bathe or soak feet in warm water rather than hot, then moisturize. •	Don’t wear socks with rubber bands or things that constrict blood flow to your feet. •	Shop for shoes in the afternoon because your feet tend to swell during the day. •	Pick a shoe with a firm sole and softer upper •	Have your feet examined by a podiatrist 1-2 times a year. If you have any of the conditions that were listed above or you have another painful condition that you'd like to have treated, call Maplewood of Sauk Prairie to speak with our Physical Therapy department. You can also speak with your health provider and ask that they refer you to us for treatment. We will set up a treatment plan for you and will work with your health provider every step of the way. Call us at 608-643-3383 today.Maplewood, Sauk City, WI, Offers Tips Concerning Communicating with Aging Relatives It seems our lives are so busy, the holidays are not the only time to check on your elderly relatives but it gives us the opportunity to check on parents, grandparents, aunts and uncles. We need to observe how they take medications, eating habits, their cleanliness, behaviors what types of groceries they are buying, their mobility and their driving skills. During the holidays everyone has an opportunity to talk about concerns that your elderly relative may have. Compare your notes with other relatives who may have concerns or have noticed issues that need to be addressed. By diagnosing a situation you can explore options to find a solution to discuss with them without telling them they have to do it. As an adult child, it can be difficult with our aging parents about many sensitive subjects. You may need to assure them that you don’t want to take over their affairs; you just want to give them options to help ease any worries they may have. By letting them know you are concerned about an issue such as their driving or eating habits, you can provide a solution or offer other arrangements. You need to be prepared for them to disagree with you, but that is okay too. Things to remember: •	Don’t judge •	Start with most concerning issues •	Just getting it out there lets them think about it. •	Be patient •	Let them give their opinion •	Let them know there are many options It is a natural reaction for anyone to fear losing independence and become a burden. By talking about these concerns it may reduce the uncomfortable feelings or worries about not being able to live at home. Reassure them there are agencies to help with in-home care, enabling people to stay in their own homes longer. •	Educate yourself with the types of services available in your relative’s hometown and community. •	Try to meet these agencies face to face without your relatives. Discuss with the caregiver life style preferences, needs concerning transportation and any other needs. After you’ve narrow down the choices, visit them with your relatives or schedule a home visit. •	Word of mouth referrals are the best. Ask friends, physicians, ministers, religious organization or go on social media. They are a great source of information and you can discuss the pro and cons. During the holidays, family get-togethers are a great time to talk about aging relative’s wishes. It gives family members the opportunity to be involved with choices and decisions. For more information, contact a Maplewood social services representative for more information www.maplewoodsaukprairie.com or (608) 643-3383. For people with arthritis, everyday actions such as opening a door or writing a list can be a painful struggle. Several simple exercises done a few times a week can soothe artritis symptoms. Check with your health care provider to see if the following exercises are right for you. Thumb touch: Keeping your movements slow and smooth, touch each fingertip to your thumb, starting with the index finger and moving toward the pinkie. This movement helps to increase the range of motion in thumbs, making it easier to pick up small objects such as a toothbrush or spoon. Wrist workout: Stretch your arm in front of you. Bend your wrist backward, then forward. Next, stretch your wrist the other direction by turning your palm to the ceiling, then back to face the floor. Strength squeeze: Improve your grip by squeezing a soft ball in your palm as hard as you can. Hold for a few seconds, then release. For stronger pinching power, grip the ball between your thumb and your fingertips and hold for 30 to 60 seconds. Do both of these exercises two or three times a week, resting your hands for 48 hours between sessions. Information comes from Illustratus.com Friends from Illustratus.com share December tips. Make Time for Friends: Take a cue from the song “Auld Lang Syne,” and make time to catch up with an old friend. It will not only boost your mood, but also your health. Having regular contact with a wide circle of friends has been proven to help people live longer, happier lives. Read for Relief: If holiday happenings bring on anxiety, get some relief by reading. A British study found that spending just six minutes with a good book can lower stress by 68 percent. Gift of Praise: One of the best gifts you can give takes little time and costs no money: a sincere compliment. Praising someone will make them feel great and give you a lift, as well. Peppermint Pick-me-up: Whether in candy canes, lotion or tea, peppermint is popular this time of year. Use it to give yourself an instant pick-me-up. The scent stimulates blood flow to the brain, which increases alertness. A snack for sleep: Having trouble sleeping and tired of counting sheep? Try a banana for a nighttime snack. The fruit contains tryptophan, which can make you drowsy. Bananas are also rich in the minerals magnesium and potassium, which help relax your muscles. Do something new: As a new year approaches, vow to try something out of the ordinary every week. Whether it’s a new activity, friend, food or simply learning a new word, bringing something different into your world can enhance brain health and enrich your life. Taking care of a loved one who requires consistent care can be very difficult experience. Of course, the role of caregiver is a very heart felt, nurturing and loving experience, but over time is can also be very wearing on the caregiver. For the caregiver, the requirements are great and can cause a great deal of stress, worry and a physical toll over time. The caregiver often does not receive “a break” from their role, sacrificing much of their own freedom and lifestyle to care for their loved one instead. The caregiver often places their needs behind that of their loved one for months or even years, which can create a very tenuous position. Fortunately, there is another option that can be utilized that can help everyone involved; the loved one, the family and the caregivers. This option is called Respite Care and is a type of shorter term care that allows the caregiver to take time away from their caregiving responsibilities and also helps the loved one with other socialization and a loving and caring environment to be cared for. The loved one can be cared for at a facility, like Maplewood of Sauk Prairie, for weeks or even months, until the time comes when their care can be taken over again. They are cared for by a skilled staff that has significant experience in the area of elder care and/or memory care. There are a variety of benefits that your loved one receives through respite care. The caregiver also experiences benefits from short term care of their loved one. There are times in life that caregivers may need a “break” from their caregiver responsibilities for a short period of time. When the situation arises, the professionals at Maplewood of Sauk Prairie in Sauk City, Wisconsin are prepared to help you in this process. Our respite care services allow us to take care of your loved one in the way you expect, for a specific duration of time. This allows you to take some time off to “de-stress”, unwind, take a trip, complete a project…whatever it is that you need to do. Should you want to learn more about our respite care program, call us today at 608-643-3383.